When thinking of Haiti, don't be fooled by its borders. 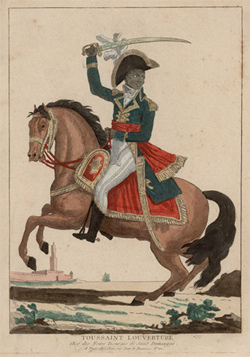 In the first years of the 19th century, Napoleon decided he’d had enough of the Haitian patriot, freedom fighter, and self-proclaimed defender of the French Revolution, Toussaint Louverture. Louverture had organized slave revolts in Haiti and defeated armies sent by the Spanish, English, and the French. A man of the Enlightenment, he took the ideas of liberté, egalité, and fraternité quite seriously. Never sentimental, Napoleon realized that France’s Caribbean colonies were heavy on the lucre, and that he needed slave labor to keep the profits flowing. Louverture had become a nuisance.